"This pie is delicious. I have been making it for over 25 years. Garnish each slice with whipped topping and chopped walnuts if you like." Cream butter in a mixing bowl. Gradually beat in the sugar with an electric mixer until light colored and well blended. Stir in the thoroughly cooled chocolate, and vanilla extract. Add the eggs, one at a time, beating 5 minutes on medium speed after each addition. 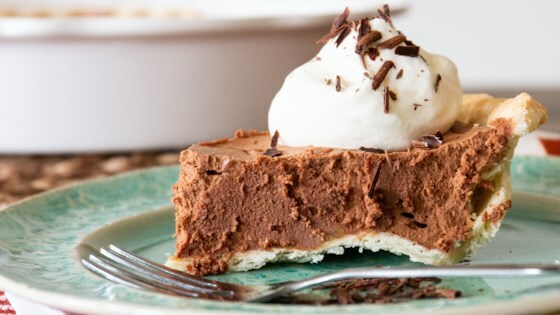 Spoon the chocolate filling into a cooled, baked pie shell. This recipe contains raw eggs; some stores sell pasteurized-in-the-shell eggs which would work well in this recipe. We recommend that pregnant women, young children, the elderly, and the infirm do not consume raw eggs. Learn more about egg safety from our article, Making Your Eggs Safe.